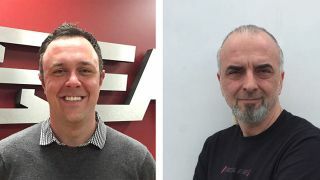 Eastern Acoustic Works (EAW) has appointed Bernie Broderick and Jeremy Forsythe to business development managers, live and installed sound, respectively. The new positions provide a more concentrated focus on the two primary vertical markets for the loudspeaker manufacturer. Broderick is a veteran of live production with nearly 30 years of experience from sound company owner, pro-touring FOH, systems technician, to 17 years as an educator for EAW. He was also one of the initial collaborators of the ADAPTive line of products and has worked with hundreds of shows and numerous tours that utilize the product line. Forsythe joins EAW after spending the last five years as lead designer and project manager for an AV integration firm operated by Hollywood nightclub owner John Lyons, who was integral to the design and development of EAW’s Avalon club series loudspeakers. That experience, in addition to his education in architecture, provide him with tools that will be invaluable to systems integrators.